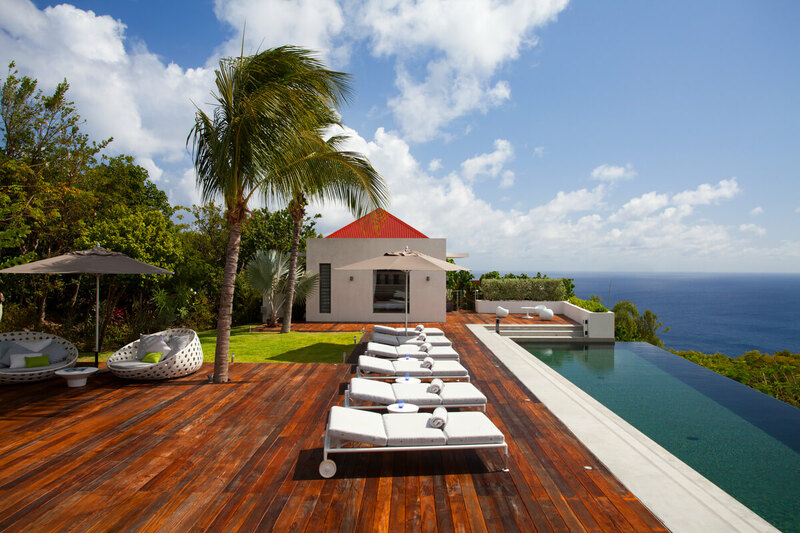 In the Gouverneur area of St. Barts, you’ll find Palm Springs Villa. This 4 bedroom, 4 bathroom modern villa is clean, spacious, comfortable, and situated to afford some of the best water views on the island. Whether you’re inside relaxing in the air-conditioning or outside lounging by the pool, you’ll be able to take in the view while making yourself completely at home. In addition to the bedrooms, there is a full kitchen, a dining area, and a comfortable living area for reading, napping, or watching TV. There’s also plenty of seating outside where you can enjoy the natural beauty of St. Barts. Amazing Sunsets and Great Outdoor space! Palm Springs is a brilliant contemporary 4 bedroom, 4.5 bath luxury villa. Nestled on hillside in Gouverneur, offering breathtaking ocean views and sunsets that will take your breath away. The open-air living, dining and kitchen areas all provide panoramic views and good breezes. The master bedroom is in the main pavilion, next to the great room. The second bedroom (bedroom 2) is located on the other end of the huge heated infinity lap pool with the best views of the sunset and the most privacy. Gouverneur beach, one of our favorites, is a short drive from the villa. It doesn’t get much better than this for an amazing St. Barth’s vacation. The great room, facing the sunset and the ocean, opens widely onto the very spacious pool deck with various living areas inviting to relaxation. Inside living area with grey sofas, large flat screen television with Dish Network, HD DVD player, home cinema, telephone, WIFI, Ipod dock, surround sound system, library, ceiling fan. Dining with a large rectangular plain wood table for 10 guests on the covered terrace by the living. Beautiful heated infinity lap pool (18m long) with a dreamful ocean and sunset view, surrounded by a very spacious deck with 6 lounge chairs, a half moon bed and various living areas. Outside shower. Beach chairs and umbrellas at guests disposal. Gustavia : 5 minutes - Airport : 10 minutes - Restaurants : 2 minute walk - Grocery : 1 minute Gouverneur beach : 2 minutes.